“Charlie” is the heir apparent to the British Throne. Unlike other princes and princelings, Charles ventured to speak publicly on a variety of matters that were either contentious or odd, thereby putting the contents of his highly individual mind out onto the nature strip for vultures, scavengers and predators to feast on. And they have. Charles might not have been the first royal to be odd or suggestible or randy (wooing Camilla with, “I want to be your tampon”) but he had the misfortune to belong to the first generation of his family that faced unbridled mass media. So Charles was dismissed as a Charlie, a right Charlie. “Johnny” is soon–to–retire Lord Jonathan Sacks, Chief Rabbi of Great Britain and the Commonwealth. Jonathan Sacks has been a phenomenon, heard, read, quoted and admired far beyond Jewry. He is Rabbi Everywhere – in the secular press, in the House of Lords, all around the Jewish World, in his weekly Torah commentaries and through his score or more highly successful books. Jonathan Sacks is eloquent, articulate, smooth, Everygoy’s Philosopher. His way with words impresses almost everyone, including – I sometimes suspect – himself. Of this, more (or less) later. After 22 years as Chief, Rabbi Sacks is retiring. He claims credit for starting the wave of holy retirers: I was first, then Pope Benedict, then Archbish Rowan Williams. We’re waiting now for the Dalai Lama. And that’s another thing – he’s witty: and it’s not the leaden wit of the ponderous pulpiteer or politician, but the nimble footed work of a knightsmove mind. He is a philosopher by training, a practitioner of Goon Show paradox. At a gathering of over 800 “attendees” (excruciating word; did none attend voluntarily, people we might designate as “attendors”? ), Prince Charles delivered a speech in praise of the retiring Chief Rabbi, calling him “a light unto this nation”, before collapsing into cliché. Now the prince is not Jewish. He doesn’t attend synagogue. What does he know about rabbis? What does he care? Is it the Goon Show tendency alone that they have in common? The answer is Israel’s assassinated Prime Minister Yitzchak Rabin, whose funeral the two attended in 1995, together with Tony Blair. In the aircraft Blair and Charles were intrigued by the reading material that engrossed the rabbi for hours – a large book set out with central columns of Hebrew script surrounded by columns of finer lettering that extended to the margins. The Bible, with commentaries by Rashi and others. What part are you reading? Rabbi Sacks explains the story of the perfectly red cow that is slaughtered and burned to create ashes to render ritually unclean persons pure. The PM and the Prince are fascinated. The rabbi gives them the comments of Rashi – the great medieval explicator. On the return trip, Charles and Tony ask for another scripture lesson. The Chief obliges, this time with quotes from Maimonides, Samson Raphael Hirsch and others. And so it is through the year following that Tony Blair receives a lesson in each weekly Torah portion of the annual cycle of reading. The prince goes back to princing and to opining and to his life as lampooned Charlie. The rabbi goes back to writing and teaching and preaching with his extraordinary acuity and virtuosity. Such is his facility, his pirouette upon the point of a thorny question, that one might misgive: is this all surface and no substance? The ultraorthodox world has been deafeningly silent about Sacks’ disturbing moderation; their silence convinces me that even they can’t fault his learning, his authenticity, his substance. Does the chief enjoy the adulation? Just a little bit? He wouldn’t be human if he did not. It must be evidence of my own human envy to entertain these misgivings. The rabbi’s ministry is serious, pregnant with revelatory insights. How to live in our particularity as co-citizens among a broader humanity? How to remain authentic, Torah-true Jews, proudly, neither superior nor inferior to others? These are not idle questions; they are dilemmas, and not only for the Jews of today. Those German Jewish patriots of WWI who lived to see their Fatherland go to war against them, lived and died in that risky experiment of embracing citizenship. 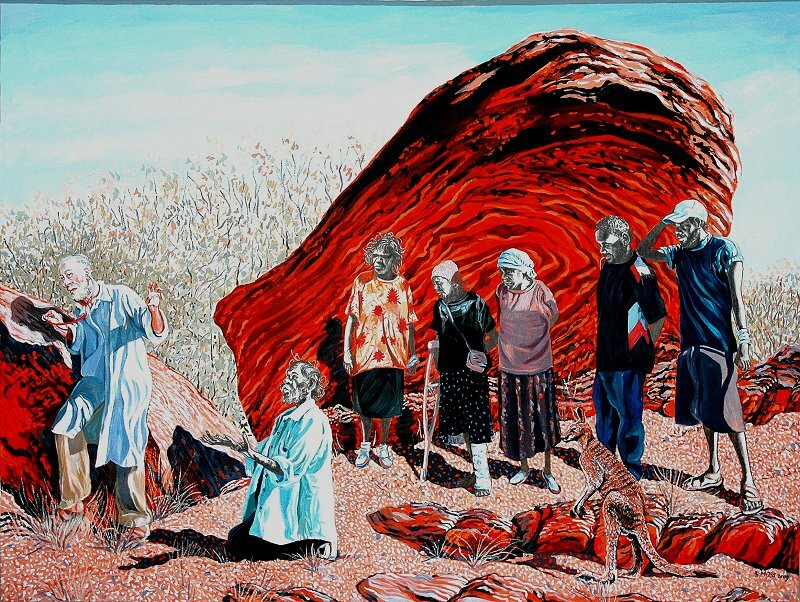 A similar parlous choice faces Australian Aborigines: how much must we leave or lose, how much do we gain, as we walk the narrow bridge to modernity? Jonathan Sacks has spoken from the beating heart of an ancient tradition to this Jew who was born astride that tradition and a plural world. That world changes too fast just as Judaism resists change. Not so resisting is Jonathan Sacks: read his “To Heal a Fractured World”, read him on “The Dignity of Difference” to encounter his audacious openness. Praying as I do every day in a liturgy that is older than Jesus, observing minute regulations (as various as which days I may cut my hair, which hand to grip with when piddling), while walking as I do in worlds so different and mutating, I seek a guide. I need, I ache to hold my fragments together. Can you be a ‘fan’ of a Rabbi? If so, then I am one.